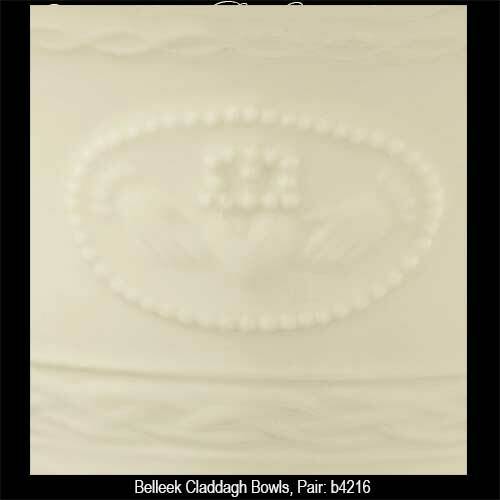 Belleek bowls are made of fine china that feature the Claddagh and are enhanced with embossed Celtic knot-work. The Belleek Claddagh Bowls were Introduced in 2014. 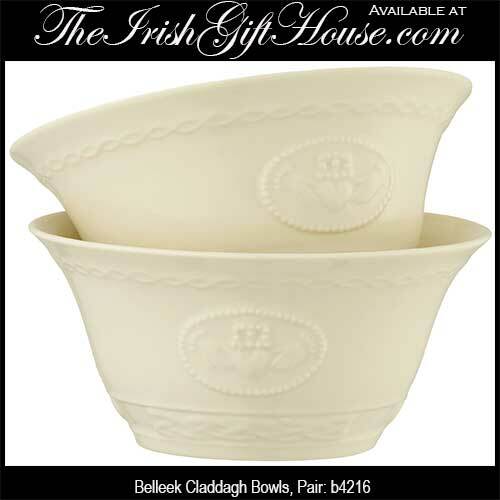 These Belleek China bowls are enhanced with the Claddagh and Celtic knots on both sides. The pair of Belleek Claddagh bowls measure 6" wide x 3 1/4" tall and hold 20 ounces. The Irish bowls are crafted of fine china in Belleek, Ireland and are gift boxed with Claddagh and Celtic knot history cards, complements of The Irish Gift House. Belleek Claddagh dinnerware is safe to use in the dishwasher and microwave along with the freezer and oven (to 375F).